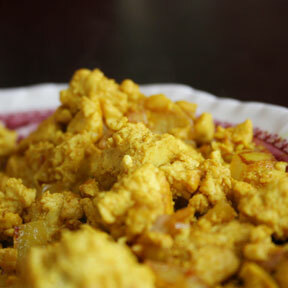 This is my favorite scrambled tofu recipe by far. It’s one of Isa Chandra Moskowitz’s recipes from the Post Punk Kitchen. I love to switch it up and add artichokes and/or sun-dried tomatoes. If’ you’ve always wanted to try tofu, this is your recipes. Great for first timers! Heat oil in skillet over medium-high. Saute onions 3 minutes, until softened. Add mushrooms, saute 5 minutes more. Add garlic, saute 2 minutes more. Add spice blend and mix it up for 15 seconds or so. Add 1/4 cup water and deglaze the pan, scrapingthe bottom to get all the garlic and spices. Crumble in tofu and mix well. Don’t crush the tofu, just kind of lift it and mix it around. You want it to remain chunky. Let cook for about 15 minutes, stirring occasionally and adding splashes of water if necesary to keep it from sticking too much. Lower the heat a bit if you find that it is sticking. Add lime juice. Add nutritional yeast and mix it up. If it seems too dry add splashes of water. The moistness really depends on how much water the tofu was retaining before you added it. Entry filed under: Entree, Tofu. This is an older post, but I had to share! I make this recipe, but when I ran out of curry one day I tried using taco seasoning instead. I ended up making something my family loves! So now, for scrambled tofu, I use taco seasoning, bell pepper, onions, and some black beans. The longer it sits, the better!